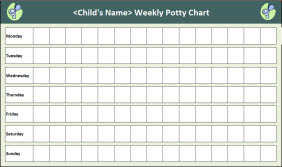 Use our FREE Weekly Potty Chart template to record your child's potty use. After printing the chart, place a sticker in each square when your child uses the potty. To add extra encouragement, offer a reward when the chart is full. In lieu of stickers, you can print and laminate the spreadsheet and check the squares with a dry erase marker. This method allows the chart to be used over and over. Click on the below image or link to download the spreadsheet. Choose "Open" to immediately open the template for editing, or choose "Save" to save the template to a location on your computer.